Yesterday was St. Lucy’s Day, and traditionally that means cuccìa here in Sicily. There are two versions – sweet and savoury, although the sweet one is much more widespread, and the savoury version has practically died out (which of course is one of the reasons I decided to cook it, albeit with a rather cavalier approach to the ingredients, as you will see…). Either way, the basis of the recipe is wheat, and wheat berries to be precise (no, I don’t know why they’re called “berries” either, seeing as they’re not). The tradition dates back to when, on St. Lucy’s day in 1646, a ship unexpectedly arrived in Palermo with a cargo of wheat, thus bringing an end to the famine that had hit the city. Rather than waste time turning it into flour and then bread, the locals boiled the grains and ate them as a soup. This is why, traditionally, no wheat is eaten in the form of flour (and thus bread or pasta) on St. Lucy’s day, but only as a grain. In the savoury version of the dish, the wheat berries may be accompanied by legumes such as chickpeas (in particular), beans and lentils, but also by vegetables, with cabbage and cauliflower leading the way. Consequently, if you want bread to accompany your cuccìa, you’ll have to find a wheat alternative, which is why on this day the bakeries sell pane di Santa Lucia, made with cornmeal. 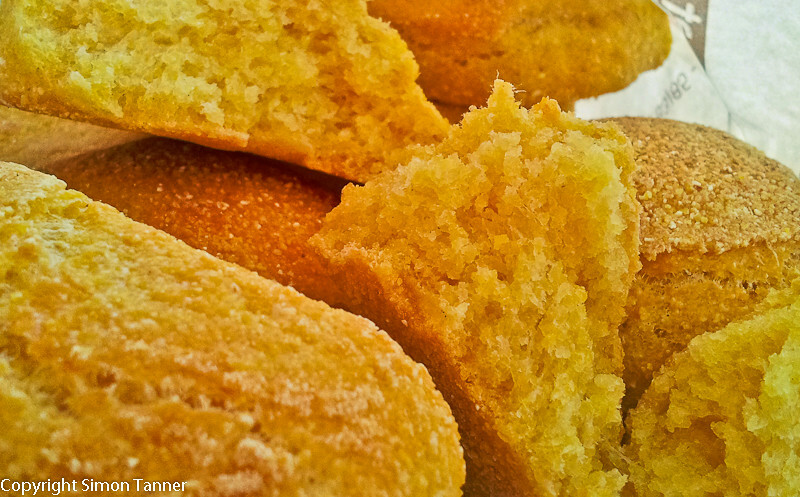 This gives the bread a dense, heavy texture, as can be seen from the photos. It also explains why it’s sold in the form of rolls rather than whole loaves; they may be small, but they weigh about the same as a small orange. The sweet version is similar in consistency to English rice pudding, with the wheat cooked in milk, and then mixed with ricotta and sugar. I decided to take the savoury route this time, but will probably try the other incarnation later in the week (I’ll let you know if I do). If you’re going to do the cuccìa properly, it takes two days (since this is how long the wheat should be soaked before cooking), plus a few hours’ cooking. Now, I like to follow tradition generally speaking when it comes to food, for the simple reason that if something has been cooked the same way for centuries, it probably tastes good, otherwise people would stop cooking it or change the recipe. This is also why I’m sure the end result will be superior if you follow the traditional procedure. But, and the “but” is big and twofold: if a) you think I’m going to plan my dinner two days ahead, and b) you think I expect you to plan your own dinner two days ahead, well, you’re mistaken. I will quite happily put some beans or chickpeas to soak overnight and then cook them the next day. It’s something I’ve got used to, and yes, as I said, you can taste the difference. But two days before?? And then have to remember to put the chickpeas to soak the day before, and the beans the night before, and the lentils a couple of hours before. Don’t know about you, but I’d need a personal assistant or some kind of app for my smartphone to avoid forgetting some crucial “put legumes into water to soak” appointment. So, to save myself (and therefore you) all the stress, I came up with the store-cupboard version below. It will no doubt elicit howls from every Sicilian nonna this side of the Straits of Messina, but what can I say – it takes twenty minutes, not two days + three hours. Be my guest, use all dried ingredients and prepare the dish from scratch. Don’t let me stop you. But if you get good quality tinned legumes, the end dish will still be very tasty, not to mention unbelievably easy and quicker (yes, just to drive the point home, it will not take you over two days). Fry the onion gently in a little olive oil until soft. Add the stock, bay leaf and legumes. Heat through well. Season to taste with salt and pepper. Ladle out into soup plates, and drizzle over some good olive oil. As you spoon the soup into your mouth, allow yourself a smug smile at the thought you’ve just saved yourself two days of prep. 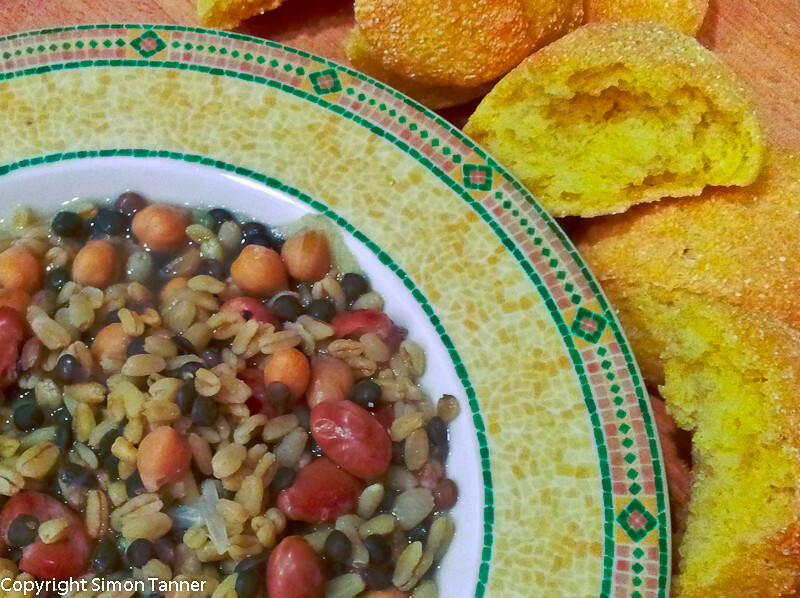 This entry was posted in Recipes, Soups and tagged legumes, soup, wheat by hungryenglishman. Bookmark the permalink. Since I renovated the kitchen I’ve had a continuous supply of soaked and soaking legumes. My girlfriends love my bean and pearl barley soups! Try soaking chick peas in beer! This week I’m doing up the terrace to make way for a Sicilian herb and fruit garden. You should take a few photos for this blog. Big Nige.